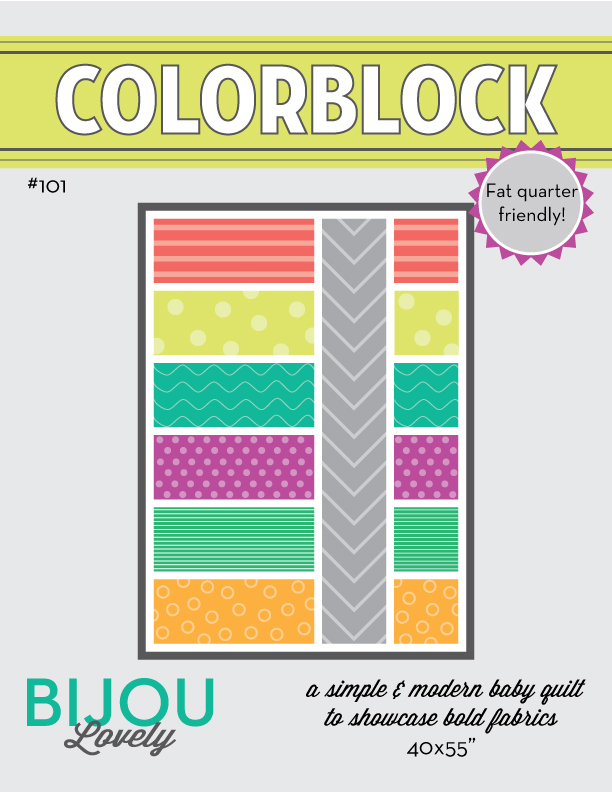 Bijou Lovely: Lunden Designs Pattern Giveaway. 140 Lunden Designs Pattern Giveaway. I hope everyone is enjoying the holidays! I wanted to pop in and share a giveaway with you before the week was over. 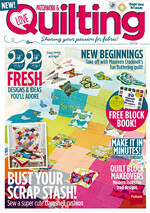 Have you all seen the quilt patterns from Lunden Designs? Melissa Lunden is the designer behind these great patterns, and she sells them in her etsy shop as well as wholesale to other shops. Melissa asked if she could send me some of her patterns to check out and share with you, and I said yes since I don't think there can ever be too many quilt patterns out there! 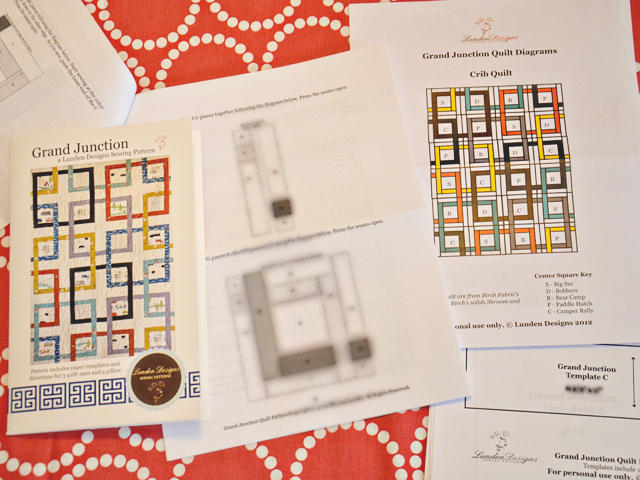 The paper patterns come with instructions (I blurred them out here to protect Melissa's copyright), as well as color quilt diagrams and full size paper templates. The instructions are detailed and the diagrams are all very well illustrated and clear, which I always appreciate! It's also nice to have the full size templates so you don't have to rescale them. 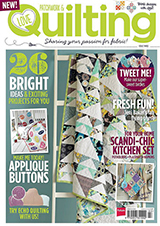 The patterns are all very modern, yet suitable for beginner to intermediate quilters. Now for the giveaway! Melissa would like to give one of you a copy of her latest four patterns, Grand Junction, Northern Exposure, Flag Day and Big Top. Simply leave a comment on this post for a chance to win! I will pick a winner next Thursday! Good luck and I hope you all have a great weekend! Update: This giveaway is now closed. Congratulations to the winner, cakegirl! 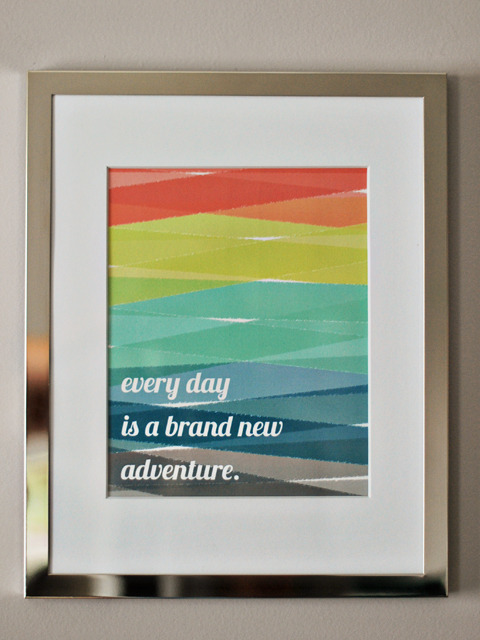 And for the rest of you...Melissa is giving everyone 10% off of her patterns using the code BIJOU10. Thanks Melissa! Beautiful patterns. Thank you for a chance to win! So lovely! I love Grand Junction especially! Thanks for the chance. Love these! Grand Junction is my favorite. Thanks for the giveaway. I would like to make all four of these! These are cute quilt designs. Like Heather, Grand Junction caught my attention too. Thank you for this giveaway chance. I've got a couple of these patterns on my 'to buy' list! Thanks for the give away! This look like fun patterns. Nice giveaway! I think Grand Junction looks like something I would like to try....it looks like nothing I've ever done before. Thanks for the chance to win! 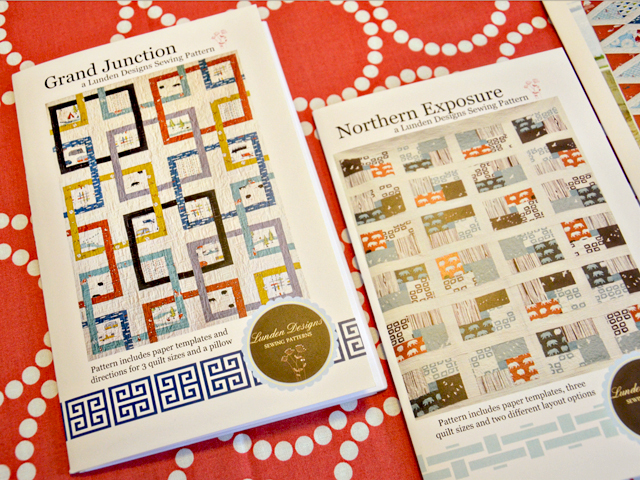 Lovely patterns, especially Northern Exposure and Grand Junction. Thanks for the chance! Cool patterns!!! I would love to win these - especially Grand Junction! Oooh, I love the look of Flag Day! oh fun! Flag day is definitely my favorite! I saw these quilt designs pop up elsewhere a couple of weeks ago-- looks like they're quite versatile. thanks for the opportunity to win! Put my name in there! I would love these - maybe I could start cutting up all my Christmas gifts!! I would love a chance to win! happy new year! 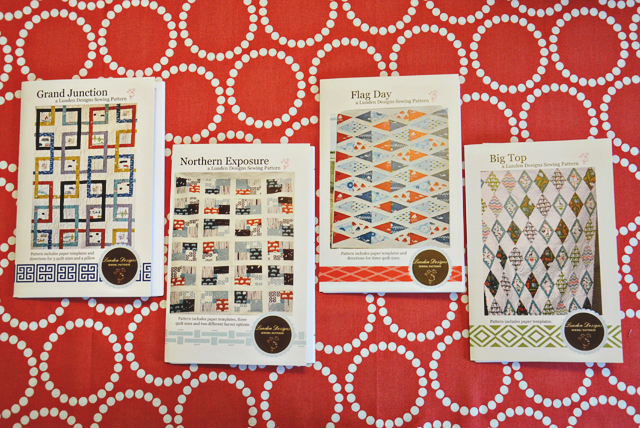 I love these patterns, especially the flag day quilt. Great giveaway! I'd really love to win this. These patterns look great! 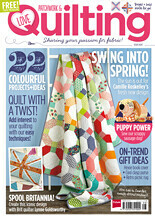 I would definitely love to win them, especially since I am planning lots of quilts in 2013! 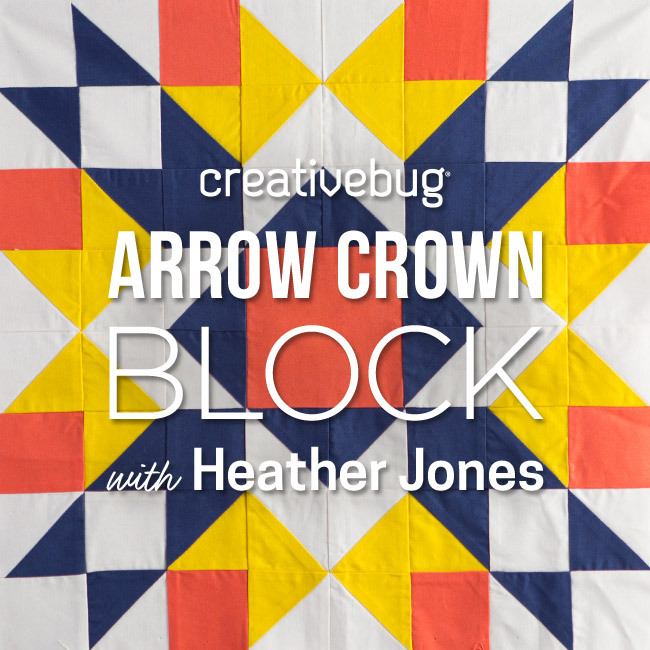 Love these patterns, particularly Grand Junction! Love the Grand Junction pattern! Thanks for the chance to win. These patterns are great! My favorite is Flag Day! Love the flag day pattern! diggin' grand junction & northern exposure. both are perfect boy patterns. That Grand Junction pattern is just great! 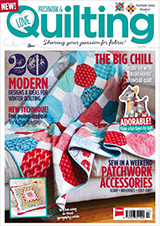 So true, there can never be too many quilt patterns and these ones are beauties. Thanks for the chance. Those look like really fun patterns. What a great giveaway. Thank you. I like these patterns! I'd love to make "Grand Junction". Thanks for introducing this designer. Those look like great quilts! Thanks! Gorgeous quilts. Thanks or the chance to win. Gorgeous patterns! And as a pattern designer myself, thank you for blurring out the inside details! I wish everyone would be as thoughtful as you. Wow! I love these quilt patterns! I would love to win them! cute! I love grand junction and flag day! These patterns (and the fabrics they're made with) are so gorgeous!! What fabulous modern patterns! I love Grand Junction! Happy New Year! These patterns are great! Would love to add these to my to do list!! Fabulous patterns from one very talented quilter. Thanks for the chance to win them. Wow - great patterns!! Thanks for the chance to win! I think Grand Junction is my favorite. Thanks! Such pretty patterns! I can imagine the endless possibilites with different fabrics!!!!! Thanks for the chance to win! What an awesome giveaway. I just LOVE Grand Junction and also Flag Day as well. Ok, the others too but really Grand Junction is my absolute favorite. Thank you so much for the chance to win these wonderful patterns. I would love these patterns! Great patterns...I especially covet Northern Exposure! Thanks for the chance. These patterns look like so much fun! I am in love with flag day! Great patterns! I especially like Grand Junction! I love these patterns, especially flag day. Thanks for the chance to win! Love the Northern Exposure pattern. I love the Northern Exposure pattern! Thank you for the great give away!!!!! The patterns all look spectacular! Thanks for the chance to win them. These patterns are great. I especially love northern exposure. Thanks for the chance to win!! How generous. The Big Top looks like a lot of fun! Thanks for the giveaway, ladies! Grand Junction looks like fun! Thanks for the giveaway! Love the patterns - thanks for the chance to win. 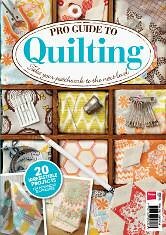 quilting is something that I'd really like to pursue in 2013 - maybe a twin-size for each of our three kiddos? thanks so much for hostessing this! Ooooh fun... I REALLY like Grand Junction! Love those patterns ! Thanks for the giveaway! These are great patterns! Happy New Year! Thanks for the intro to new patterns! I'm loving Southern Exposure! She certainly has a great eye for design! I love that they are contemporary AND symmetrical! Great patterns! I love them! hope you have a happy new year. I have looked at Northern Exposure before. That's the one for me to buy if I don't win. Thank you. Great patterns! Thanks for the chance to win! beautiful patterns! I love the first one! Thanks for the chance . Those patterns are beautiful! I would love to use them! Thank you for the chance to win! Ooh! I love Big Top best. Thanks for the chance! Those are great ideas! I'm excited for the chance to win one! Fun patterns! Hope you and your family had a great Christmas, Holly! These look awesome! HAPPY NEW YEAR and thanks for th chance to win! I l.o.v.e these patterns! Thank you for the give away. Ooh, I would love to win! Happy New Year! Fun! Merry Christmas and have a wonderful 2013! Wonderful patterns! Thank you for the opportunity to win! Beautiful patterns! Thanks for the chance to win. Looks like great patterns! Thanks for the giveaway! Thanks for the giveaway. I've been wanting to try the Northern Exposure pattern but figured I should finish my current project before jumping into anything else. What great patterns. Thanks for hosting this giveaway! Thank you for introducing us to a wonderful quilt designer! Thanks for the lovely giveaway! Lovely patterns. Thank you for sharing. All the best for the season. Such lovely patterns! I particularly like Grand Junction! Liking these patterns for the bed quilt I'm planning to make. Northern Exposure is my fave....will be buying it if I dont win! Thanks for the chance and Happy New Year to all. 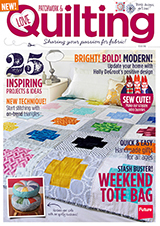 What a great selection of modern quilt patterns! I would love to win these, I already know which order I'd make them! Grand Junction for me, Northern Exposure for my daughter, Flag Day for my son, and Big Top for my 6 month old grandson! So, I have my fingers crossed! Such talent! Thanks for sharing her creativity with us! I love these patterns. Tank you for the fun site you've got. I agree that you can't have too many patterns, and these ones are fantastic! Thanks! I love the look of the new modern designs. These are awesome. I would love to try all of them in 2013. Beautiful patterns! Thanks for the giveaway and Happy New Year! They look very well done! I love good patterns. Happy New Year and thanks for the chance to win. The patterns look cool. Thanks for the giveaway and happy holidays to you too! Beautiful! I would love to win! Flag Day and Big Top are just lovely. Thank you for the opportunity!!!! Happy New Year! I love these patterns! Thank you for the opportunity to win one! I would be honored to try one or more of these patterns! Happy New Year! These look like sooo much fun! Thanks for the chance! These look like a lot of fun! I'd love to make them. Thanks! I absolutely love the Grand Junction pattern! It reminds me of the first quilt I ever made :) Thanks to you and Melissa for the giveaway! I could sure use patterns, especially such nice ones. I'd love to try any of these. Thanks for the offering! Love the patterns! That Grand Junction pattern is really fun! Thanks for offering a giveaway! Those patterns look wonderful. I would love to win them. Thanks for the chance!! Really love all four of the patterns and can imagine making them in all sorts of colorways. That is the sign of a great pattern! Love the contemporary vibe of the patterns! Very fun!